You are meeting up with friends and you're thinking about where to go for coffee. Did you ever consider your coffee could cost you $6.50 if you choose the wrong place? 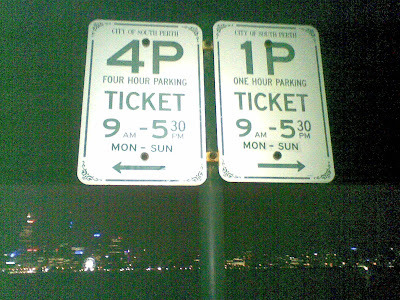 In South Perth, parking your car for two hours will cost you $1.50 / hour on the riverside before 5:30pm. In Applecross, with four cafes it costs nothing to park your car. In Fremantle, everywhere is ticket parking. If you can, next time you go out, take a few photos of parkng signs and email myhomeinperth @ gmail.com with the location of where your photo was taken. Bookmark this page and this might help you plan your next pub, dinner or coffee outing.